A dozen years ago things had begun changing. First there were a few modest safety and emission improvements required on new cars; gradually these became more comprehensive. The governmental requirements reached an adequate level, but they didn't stop; they continued and became more and more stringent. Now there were very few of the older models left, through natural deterioration and... other reasons. They reached a straight section of the road and Buzz opened it up all the way and held it. The MSV was quite a way back but not so far that Buzz couldn't distinguish the tall antenna standing up from the back bumper. Antenna! Not police, but perhaps a Citizen's Band radio in the MSV? He quaked slightly and hoped it was not. The straight stretch was coming to an end now and Buzz put off braking to the last fraction of a second and then sped through a 75-mph right-hander, gaining ten more yards on the MSV. But less than a quarter mile ahead another huge MSV was slowly pulling across the road and to a stop. It was a CB set. The other driver had a cohort in the chase. Now Buzz was in trouble. He stayed on the gas until within a few hundred feet when he banked hard and feinted passing to the left. The MSV crawled in that direction and Buzz slipped by on the right, bouncing heavily over a stone on the shoulder. The two MSVs set off in hot pursuit, almost colliding in the process. Buzz turned right at the first crossroad and then made a quick left, hoping to be out of sight of his pursuers, and in fact he traveled several minutes before spotting one of them on the main road parallel to his lane. At the same time the other appeared in the mirror from around the last comer. By now they were beginning to climb the hills on the far side of the valley and Buzz pressed on for all he was worth, praying that the straining engine would stand up. He lost track of one MSV when the main road turned away, but could see the other one behind him on occasion. Climbing the old Monument Road, Buzz hoped to have time to get over the top and down the old dirt road to the right, which would be too narrow for his pursuers. Climbing, straining, the water temperature rising, using the entire road, flailing the shift lever back and forth from 3rd to 4th, not touching the brakes but scrubbing off the necessary speed in the corners, reaching the peak of the mountain where the lane to the old fire tower went off to the left ... but coming up the other side of the hill was the second MSV he had lost track of! No time to get to his dirt road. He made a panicked turn left onto the fire tower road but spun on some loose gravel and struck a tree a glancing blow with his right fender. He came to a stop on the opposite side of the road. the engine stalled. Hurriedly he pushed the starter while the overheated engine slowly came back into life. He engaged 1st gear and sped off up the road, just as the first MSV turned the corner. Dazed though he was, Buzz had the advantage of a very narrow road lined on both sides with trees, and he made the most of it. The road twisted constantly and he stayed in 2nd with the engine between 5000 and 5500. The crash hadn't seemed to hurt anything and he was pulling away from the MSV. But to where? It hit him suddenly that the road dead-ended at the fire tower, no place to go but back. Still he pushed on and at the top of the hill drove quickly to the far end of the clearing, turned the MG around and waited. The first MSV came flying into the clearing and aimed itself at the sitting MG. Buzz grabbed reverse gear, backed up slightly to feint, stopped, and then backed up at full speed. The MSV, expecting the MG to change direction, veered the wrong way and slid to a stop up against a tree. Buzz was off again, down the fire tower road, and the undamaged MSV set off in pursuit. Buzz's predicament was unenviable. He was going full tilt down the twisting blacktop with a solid MSV coming up at him. and an equally solid MSV coming down after him. On he went, however, braking hard before each turn and then accelerating back up to 45 in between. Coming down to a particularly tight turn, he saw the MSV coming around it from the other direction and stood on the brakes. The sudden extreme pressure in the brake lines was too much for the rear brake line which had been twisted somewhat in his spin, and it broke, robbing Buzz of his brakes. In sheer desperation he pulled the handbrake as tightly as it would go and rammed the gear lever into 1st, popping the clutch as he did so. The back end locked solid and broke away, spinning him off the side of the road and miraculously into some bushes, which brought the car to a halt. As he was collecting his senses, Buzz saw the two MSVs, unable to stop in time, ram each other head on at over 40 mph. Comments on "A Nice Morning Drive"
I guess this is the first comment. I wonder if anyone knows that Rush (and particularly Neil Peart) were inspired by this fictional piece to write a song for their Moving Pictures album (before cds) called "Red Barchetta". The song takes place in the future where the "Motor Law" has prohibited small sportscars from being on the road. It's an excellent musical piece with good harmonics and Wikipedia has some interesting facts and guided me to this article. Ahhh...not the only ones Doug. "Red Barchetta" has been my favorite Rush tune ever since I first listened to "Moving Pictures" so many years ago. I have always meant to look up the story that inspired the song but...never got around to it. I Googled 'red barchetta' on a lark this evening and was taken to the Wikipedia article...which led me here for the text of the original story. Fascinating! Red Barchetta is my favourite Rush song. While I'm not a spors car person (I did dabble a bit with a 2001 Miata, but that was my wife's car) - I'm primarily a Cadillac guy (I have 4 but 2 are convertibles so there! ), Mr. Foster's story is a great read. I wonder how many folks on this board can grasp the historical significance of the timing of the story and the ironic implications of how Mr Foster's visions were warped, twisted reversed and yet made somwewhat valid all at once. I wonder how many readers of this board today were even around when the original R&T article (story) was published. If you want to get a car with the worst possible mileage of any model, get a 1973 or 1974 model. Moving on. From Mr Foster's vantage point, indeed from many "enthusiasts" point of view in the summer of 1973, the future of american automibles looked pretty dull, grin and ugly, everything pointed to bigger behemoths that sucked up more gas, and were just plain ugly because of future safety regs. Remember that several lines dropped their convertible models right at this time. Then sometime between when Mr. Foster wrote his article and the magazine was printed and distributed, something happenned - and none of us saw it coming! that would change everything. a Cadillac wheel cover crest to the first one who posts the correct answer - the full answer. I'll update this in a couple days. Now I'm going to have to search ebay for a Nov 1973 Road & Track!!! Any chance that you're talking about the "gas shortage" of 1973? OPEC set up an embargo to artificially limit the amount of gas produce world-wide and since we didn't have a strategic reserve set up at the time, the embargo caused prices to jump from approximately $0.50/gal to around $2.00/gal. until the U.S. was finally able to talk OPEC into producing at a reasonable rate again. The gas prices stayed high enough that MPG entered the American lexicon and began to dictate auto makers decisions more completely than safety consideration ever did. Mike wrote: "If you want to get a car with the worst possible mileage of any model, get a 1973 or 1974 model." This is patently false. The 1.8 and 2.0 liter Porsche 914s in 1973 got better mileage than the 1969-1972 914s. Those sold in the US had electronic fuel injection. Some of the 914s sold in Europe had Solex carburetors, and did not get as high mileage. And the 1973 and '74 914s are widely regarded as the most visually appealing years for the car. Thanks so much for the reprint of this story. I knew that there was a story that inspired the Rush song, which is one of my favorites, and always wanted to read it. I found the link to this in a Wikipedia article about the song. What inspired my search was a license plate I saw the other day - "REDBOAT". Barchetta is the Italian word for "Small Red Boat", and seeing that made me immediately think of the song and do some Googling. I find the story to be very timely. If I didn't know the date it was published, I could have made a very good guess. I have owned a 1970 Corvette convertible for 20+ years and observed how the increasing federal smog regulations literally killed this beloved sports brand. This, and the death of the convertible were definitely the dark ages of driving enjoyment. Are you sure this was in Road and Track? Because I remember reading this story in Car and Driver about the same time. referenced) that you can view at https://docs.google.com/viewer? Oops, let's see if bbcode works: https://docs.google.com/viewer? I would also consider taking 405 to I-10 west, then taking PCH through Malibu. The traffic will be less than on 101, and after Pepperdine it will drop to about zero. Plus it drops you right into Oxnard. Delight! 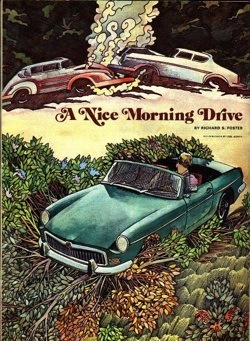 I thought I'd never see "A Nice Morning Drive" in print again! @ Mike Santos: I think you're referring to NitSuh and Ralph the Nit-Wit but those all came before the summer of '73. Enforcement of the HSA of '70 is what killed fun cars and that enforcement started in ca. '72, prompting this story and a parade of Jack-Booted regulations designed to make driving as easy, and unintentionally, as safe as falling off a ladder. If this wasn't what you had in mind, it's been long enough to give the world a clue, if it was, 'sokay, you can keep the crest.